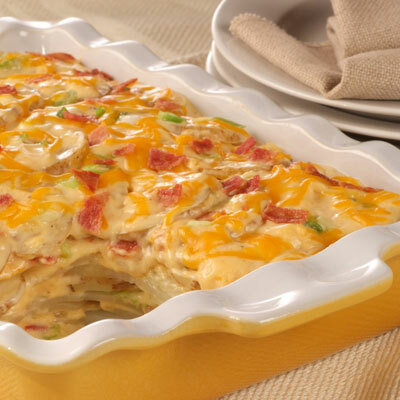 We took traditional scalloped potatoes and made them extra tasty in this potato recipe with a velvety cheese sauce made from Carnation Evaporated Lowfat 2% Milk, plus lowfat cheese and turkey bacon. These potatoes are so rich and creamy you will never miss the fat! PLACE potatoes in large saucepan. Cover with water; bring to a boil. Cook over medium-high heat for 8 to 10 minutes or until just fork tender; drain. MEANWHILE, HEAT butter in medium saucepan over medium heat. Stir in flour, salt and pepper. Gradually stir in evaporated milk, water and 1/3 cup bacon. Cook for about 8 to 10 minutes, stirring constantly, until mixture comes to a boil. Remove from heat. Stir in 1 1/2 cups cheese and green onion. LAYER half of potatoes in ungreased 3-quart microwave-safe dish. Pour half of sauce over potatoes. Top with remaining potatoes and sauce. Top with remaining cheese and bacon. Microwave uncovered on HIGH (100%) power for 2 to 3 minutes or until cheese is melted.